“Anxious” and “DjD” were the first to excavate HABIBI’s release date, even before it was known to me. I confirmed with Pantheon that SEPTEMBER 20th, 2011 will indeed be the official debut day. THAT’S EXACTLY EIGHT MONTHS FROM TODAY. Sounds like forever, I know, but fellow authors assure me this is how the book world operates, and that autumn is prime time. long, drawn-out process. Thank you for not giving up on me after so many years. Looking forward to meeting and catching up on the upcoming tour. Absolutely beautiful, Craig. These covers are all stunning—and what’s another 8 months? Nothing! Have you worked out the back cover and flaps yet, by chance? the design is so beautiful. Very much looking forward to reading this. Thanks for giving credit to me. Very nice covers! The mock up cover does look best to me. That’s really great great news! Next autumn will be bright, waiting to see you soon in Europe! its goregous. it must feel strange to have finished it. we are very lucky readers! Me and the wife cannot wait to buy it. By the way, is there any plan for a digital release? Oh it’s coming out on my birthday Love the cover… can hardly wait! I love it. Congratulations on getting the cover done! This book is going to be gorgeous. I’ll bite: what’s the math equation mean? Also, the above link mentions that it will be available as an ebook. Is that so, Mr. Thompson? Or perhaps is that boilerplate that was put up in haste? Or another possibility that you haven’t spoken at all to your publisher about it. I’d be curious to hear more about that direct from the author’s mouth if possible. No matter what, I’m circling the day on my calendar. Can’t wait! I’ve gushed over BLANKETS way too many times — now I’ll have something new to preach about. Obrigado meu amigo, see you soon running Spain and Portugal. Here we love your work, and (with 8 months anticipation) Parabems pelos 36!!! $30 for a 672 page hardcover is an amazing deal! i guess that’s one of the benefits of being with a major publisher, huh? I cannot wait. I’m doing the happy Habibi dance right now. Now doing celebratory achievement robot dance in your honor. Can’t wait to September! Congratulations! Unbelievably excited! If your tour brings you near Virginia, my store would be very honored to host you. Good luck with everything! This is AWESOME! This is awesome because this book will come 8 days after my birthday. Yay! I can’t wait to buy it! WOW. That is one gorgeous looking book! You must be so proud! I’m looking forward to its release & can’t wait to get my own copy. Truly a great artist, can’t wait for Habibi!!! Wonderful!!!!! I love the cover! I seriously cannot wait to read it! Did you know Blankets is out of print in the UK? That’s what they told me at Foyles on Tottenham Court Road in London. I asked if they knew when they would get Habibi and they said 8th of September….hmm maybe they got it wrong? ps. Also really like the first and middle cover from the top left. I cam honestly say I’m ridiculously excited to read duh a labour of love. So what’s next Craig? Some time off obviously, it may be ridiculously premature but have you plans for another monstrous 600 page behemoth? Or something a little less gargantuan? maybe war and peace needs a page-for-page graphic novel representation? Wow, that’s a very low price for such a nice looking big hardcover! Eight months, yeah, it’s long but I’ve been waiting for this for years, so I can take it. So gorgeous!!! I really can’t wait!! Looks like I’m actually going to spend my summer pacing around, waiting for fall to come!!! My birthday is 8 days after yours, and I will be enjoying it reading Habibi. Many congrats my wonderful friend! I can’t wait! I hope you come to Columbus, OH in the Autumn after it is released, we do have the world’s biggest cartoon library. So excited to finally be able to buy this book! I’ve been waiting, buying up everything else you’ve done that I can get my hands on. Best graphic novelist and amazing writer! The new book comes out 2 days after my 30th birthday, this will be a lovely present to myself! Congrats Craig! I’m so excited for you!! It looks amazing, great work, Craig! I really can’t wait. Do you know if I can purchase Habibi in September and have it shipped to Germany? Congratulations, bud! I’m loving the mockups. I can’t wait, Craig! We could never, ever give up on you, man! I am living without health insurance this year, so I do hope my way-older-than-you self will still be intact and alive on September 20th. 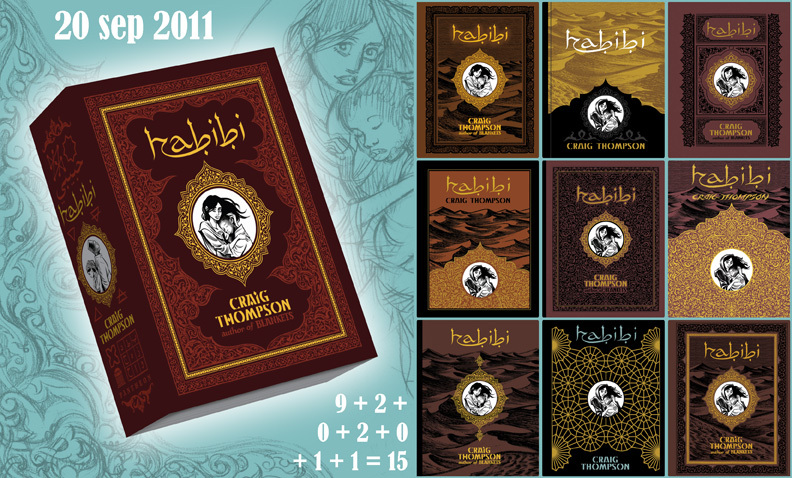 Thank you for sharing the making of Habibi with those of us who visit your blog; I think it will add an extra dimension to our appreciation of the finished copy when we finally hold it in our hands. Here’s to stellar reviews and endless kudos and happy, awestruck fans! could i please have your mailing address? Yay! You mentioned me! No, seriously, I can’t wait till the book comes out. It’s obvious you’ve been working really hard on it. Now, tell us what you have planned for after Habibi. Pingback: Westfield Comics Blog » Bob’s News About Stuff!!! Fantastic, Craig! Looking forward to it! Any chance you’ll be doing the C2E2 con or Wizard World Chicago this year? Unbelievable! please please please visit Europe on your book tour – especially Belgium! Can’t wait. Congrats on an amazing accomplishment. I’m very excited about this! Blankets is my all-time favorite graphic novel! September sounds so nice, something to look forward at the end of the summer. I loved the mockup with the cover. Please stop by in Madison, WI. Congratulations! AHHHHH! I’m so glad there’s finally a release date! I’m looking forward to meeting you and reading this story! WOW!! Beautiful cover!! I love also all others :)… only 8 months!! I’m so exites about your new graphic-novel. Thank you! I hope, I’ll haven’t waiting tooo long for the german-translation??! i am totally pumped to read this book! So, that will be a great birthday present for you. Waiting to see it in Poland and hope it’s possible. Just wanted to let you know that I’ve posted a blog on the BLANKETS cover. It’s beautiful, and I’m looking forward to purchasing and reading the illustrated novel. First of all telling you that I deeply admire you as a cartoonist and that after over 30 years reading comics american and european, i think Blankets is the best graphic novel ever written, better than Maus, Hugo Pratt´s or Jimmy Corrigan and I look forward Habibi excitedly. But I have to tell you something and may be i have waited too long and this is not the appropriate place. You committed several errors in Chapter IX of Blankets. The author of the book of Cohelet (Ecclesiastes mistranslated) is not Salomon, that’s just a very common literary fiction at that time, but it is anonymous. Interspersed passages are not added to ease the pessimistic tone. Only the known conclusion attributed to a disciple that is what keeps the book in the Canon. The book is after the exile, the third century is probably the most likely date. And finally, I think it was more reasonable to lose faith in your teacher that in your beliefs. I could tell you some more about how you “use ” the Bible in some Protestant communities, but I think it would be too much. Thank you very much and forgive my impertinence. Paco. Will we see you in Spain? And the wait is over! Now another kind of waiting begins. The kind involving lawn chairs. Looking forward to it! Craig, I cannot wait. You art is absolutely lovely. Hopefully I’ll get to see you on tour. You really nailed the cover! It’s got that religious look to it but it’s still warm and inviting. And congratulations on having a legit release date! Oh Craig, it’s gorgeous! I can’t wait to lay my hands on those pages. Hopefully, it’ll reach the Philippine bookstores few months after the release date or else I might have to buy it online and have it shipped to my doorstep. I’m super excited!!! can't wait for the book and you better make your way to the con this year! Hi, I just came across your website for the first time, and I’m thrilled to see the images of your new book. Blankets holds a special place in my heart — it made me wish I had written it, which is really the greatest compliment I can give. There were so many subtleties that I loved, such as the posture Craig has while sitting alone in his room, dwelling on Raina and silently begging to hear from her. When I’m really honest with myself, I realize that I understand every single thing he’s thinking and feeling at that point, along with many others. I always felt a vague sense of shame for reacting that way, but seeing that same behavior on the page, in the context of the rest of the novel, struck a very personal chord with me. I immediately went out and bought Goodbye, Chunky Rice, and was awed by that same sense of shame for feelings that seem so juvenile being transformed into something beautiful and artistic. I’ll be waiting for Habibi on day one of its publication, and I’ve never done that with any book before. I’m sure it will be amazing. and thought you’d dig it. Chunky Rice covered! Keep posting until September or else! Would you be available for a conference presentation? Wow! I finally tracked down your blog and got this great news. Can’t wait! Fantastic! I read Blankets a couple of years ago and Chunky-Rice just recently and I’m taken by your skill of thematic storytelling. I’ve trying to spread the knowledge about Blankets here in Finland (by mouth and blog) and actually I managed to get my hometown library to add it to their collection. Keep up the brilliant work! Do you already have news/contact for a french translation ? Can we also expect it for this end of the year? again at Casterman as published house ? Hey Craig, good luck with the book! I look forward to it with relish, I know it will be a visual feast and a great narrative. I cannot wait. I adore Blankets and I feel that although we’re so different, we relate on so many levels. Been looking forward to this for so long! I’ve checked this site once every few months for the past… jeez, Two? Three? FOUR years since it was announced? So excited to see it finished and know that I’ll be reading it relatively soon. Sadly I love in Brazil..So it’s going to be harder to get it…But I’ll try!! This is very good news. I’ve been checking your blog sporadically for years! Congrats on finishing and good luck on the tour. From reading these comments, I know that you get incredible praise from people that truly appreciate your work. Personally, I would like to thank you for your artwork and the effect it has on my life. My dad gave me Blankets when I was 17, and I was blown away by your blatant honesty and gift for story telling. Habibi appears to be the work of great effort and greater dedication. I yearn to hold it in my hands. I cannot WAIT for your book!!! Absolutely gorgeous design, like a comic version of the ‘bible’ (or Q’uran). Looking forward to its release, hello birthday present! Thank you! Finally was able to read Habibi and wow, congrats Craig. We met way back in San Diego, when we promoting books, and I was blown away then by your storytelling and continue to be now. Thank you for another beautiful piece of work.